Ryan Fitzpatrick is a legend by Jets QB standards — when he throws to Brandon Marshall or Eric Decker. The Gang Green contract dispute is over: Quarterback Ryan Fitzpatrick has re-signed with the New York Jets, on a one-year, $12 million contract with up to $3 million in additional incentives. Casual fans may wonder why it took so long for Fitzpatrick to re-sign — for months, it was clear that Fitzpatrick had no other suitors and the Jets had no exciting alternative. And, after all, Fitzpatrick was coming off of a strong statistical season. He threw for 3,905 yards last year — the highest single-season total by a Jets quarterback since Joe Namath in 1967 — and 31 passing touchdowns, a franchise record. On the heels of six Mark Sanchez and Geno Smith seasons, Fitzpatrick’s competent play represented a vast improvement. 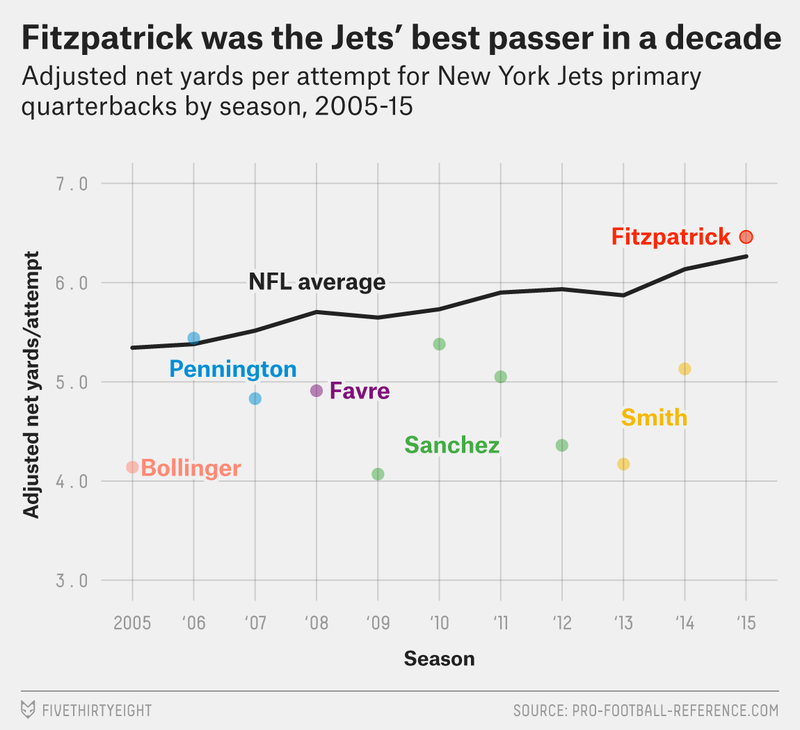 But Fitzpatrick’s numbers really only look great relative to the poor passers of Jets history and thanks to the rising tide that is lifting passing numbers leaguewide. Before Fitzpatrick, the Jets hadn’t experienced above-average quarterbacking since 2006, and Jets passers had been far below average in each of the four seasons leading into 2015. Against that backdrop, Fitzpatrick’s ever-so-slightly-above-average numbers painted the picture of a bearded savior. But although Fitzpatrick deserves credit for the strong season (along with, perhaps, offensive coordinator Chan Gailey), his top two receivers were just as responsible for the big year. Which teams got the most out of their top two receivers in 2015? Marshall and Decker were also touchdown machines. In nine of the Jets’ 16 games last season, both Marshall and Decker reached the end zone: That made them the first pair of wide-receiver teammates to each score in nine games (and only the second pair of teammates, period, joining former Cowboys Emmitt Smith and Michael Irvin). Incredibly, Marshall and Decker by themselves caught 25 of Fitzpatrick’s 31 total touchdown throws, or 81 percent. Thought of another way, Marshall and Decker saw 305 targets last year, with all other Jets players combining for nearly an equal number: 297. Yet Marshall/Decker combined for 2,529 receiving yards and 26 touchdowns, and all other Jets combined for 1,641 receiving yards and just seven receiving touchdowns. Marshall and Decker together averaged 8.3 yards per target; all other Jets averaged only 5.5 yards per target. That difference of 2.8 yards per target between the Jets’ top two receivers and the rest of the team ranked third-largest in the NFL, behind two other teams that had star receivers doing most of the heavy lifting: Jacksonville (with Allen Robinson and Allen Hurns, at +3.7) and the New York Giants (thanks mostly to Odell Beckham Jr., at +2.9). Marshall/Decker’s rate of 11.7 targets for every touchdown also ranked fourth-best among top receiving pairings,2 but the rest of the Jets were targeted 42.4 times for every touchdown pass, the fourth-worst rate in the league for receiving groups outside a team’s top two targets.3 In other words, Fitzpatrick was putting up great numbers only when throwing to Marshall and Decker — not anyone else. It’s fair to say, then, that no passing game in 2015 was as reliant on its top two receivers as the Jets’ was. Granted, the Jets’ other targets weren’t very good,4 so you would expect a large chasm in production between Marshall/Decker and the rest of the team. But that makes it more difficult to determine how much of Fitzpatrick’s numbers were the product of his own play, and how much was due to his top two targets. And that’s probably what caused such a disconnect between the Jets and Fitzpatrick’s camp during negotiations. Ultimately, Fitzpatrick signed a reasonable one-year contract, so we may be revisiting the same scenario next offseason, with the Jets having to ascertain their QB’s true worth once more. Defining a team’s top receiving duo as its two leading players in receiving yards. Behind the top duos of Seattle (9.0), Jacksonville (10.7) and New England (11.6). That ranked ahead of only Cleveland (56.8), Minnesota (57.2) and San Francisco (44.0). Bilal Powell, Quincy Enunwa, Chris Ivory and Kenbrell Thompkins were the only other Jets with at least 30 targets.